This Thursday our friends from the Struttin crew managed to assemble a very unique concert night. 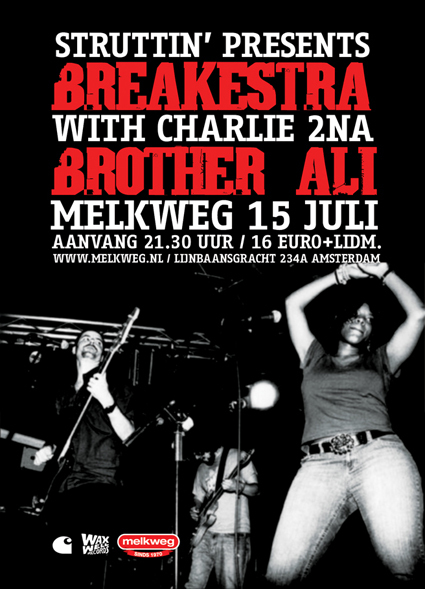 At the famous club Melkweg the American Hip Hoper Brother Ali hits the stage right after the fabulous Funk and Soul ensemble Breakestra (picture above) delivered one of their sweaty shows. 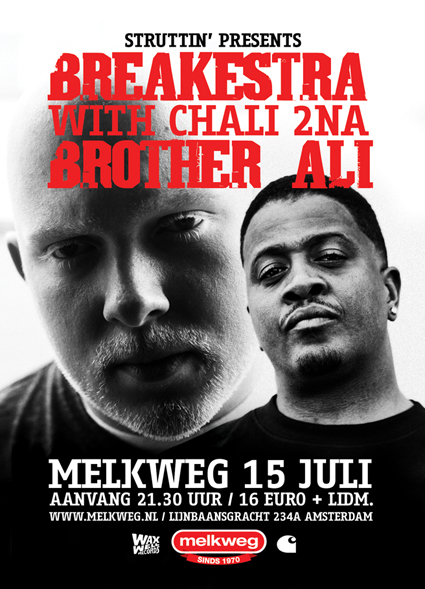 The former is one of the current most sociocritical Rap artists from the USA and comes to the Netherlands in order to solicit his latest album Us with one of his enthusiastic live performances. The latter does not want to present something trailblazing new. Instead the ten-piece band from Los Angeles bethink old Funk and Soul traditions and translate them live into handmade instrumental Hip Hop science. A night where intricate wordplay meets labyrinthine rhythms under the roof of the same ambition: they want to see the audience dance!